What is the "North Dakota Boater Education Card"? Q. What is the "North Dakota Boater Education Card"? A. 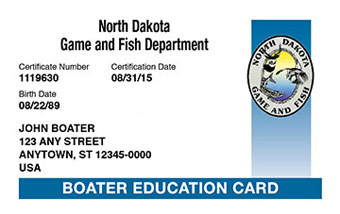 A North Dakota Boater Education Card (also referred to as the North Dakota Boaters License) is proof of competency of the basic rules of the water that all boaters should know. A. In North Dakota, no one may operate a motor powered vessel over 10 hp (including personal watercraft) if they are under the age of 12 unless they are accompanied by an adult (18 years or older). No persons who are between the ages of 12 through 15 years may operate a motor powered vessel over 10 hp (including personal watercraft) unless they are accompanied by an adult (18 years or older) or they have taken and successfully completed a North Dakota Game and Fish Department approved safe boating course. Q. How do I get my North Dakota boaters	license? For a complete overview of the North Dakota online boating exam process, please visit our North Dakota Boating License Online Exam Process overview page. Q. What if I don't pass the North Dakota Boating Test? A. There is a one-time fee of $29.95 paid to BOATERexam.com®. It includes unlimited free retries of the final exam. It also gives you access to an instant temporary certificate of completion as well as an official card that will arrive in the mail in 3-5 weeks. Learn more about BOATERexam.com's Risk-Free Policy.